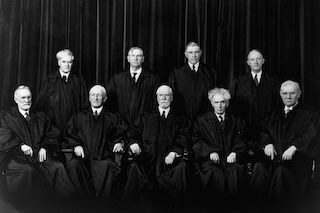 Welcome to Lone Dissent, a website dedicated to some of the loneliest work that U.S. Supreme Court Justices have been engaging in for centuries: dissents. And not just any dissents, but lone dissents. Yes, we’re talking about those cases where just one Justice could not be persuaded by their colleagues and who instead chose to write a dissent, explaining why he or she was absolutely right and all of their fellow Justices were absolutely wrong. What’s striking about both of those dissents is that they eventually became the majority view. Plessy was effectively overruled by Brown v. Board of Education 58 years later, and Minersville was explicitly overruled only 3 years later, by West Virginia State Board of Education v. Barnette. However, the vast majority of dissents never amount to much. They do get published and memorialized in the U.S. Reports alongside the majority opinions, providing a permanent record of winners and losers. But which ones are really worth revisiting, and why is it so hard for us to differentiate the prescient dissents from, say, the stubborn tirades? Who knows. All we do know is that if we never take the time to revisit those dissents and make an effort to understand their arguments, we’ll never know.